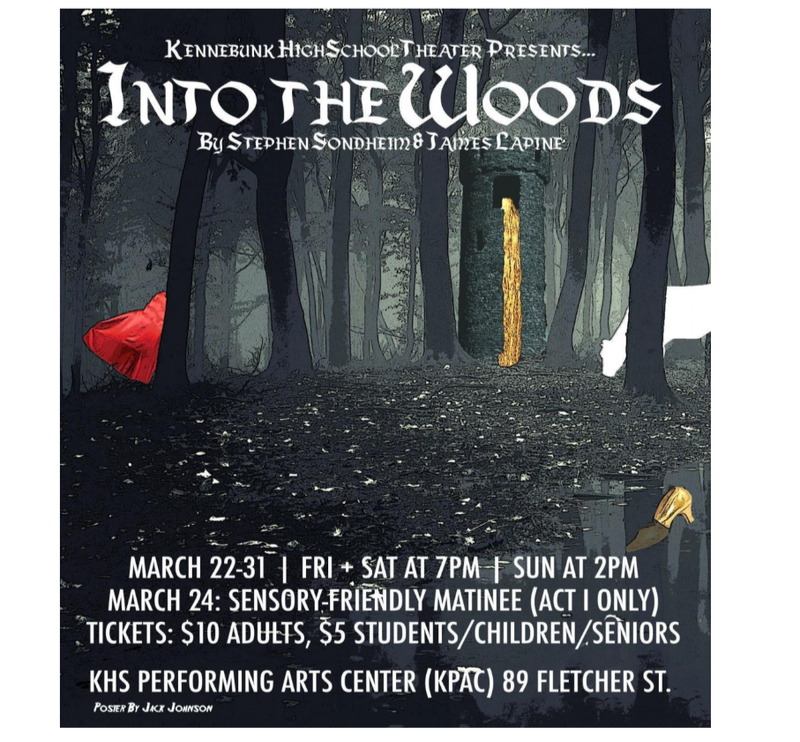 Kennebunk High School’s winter musical, Into the Woods, is coming up. 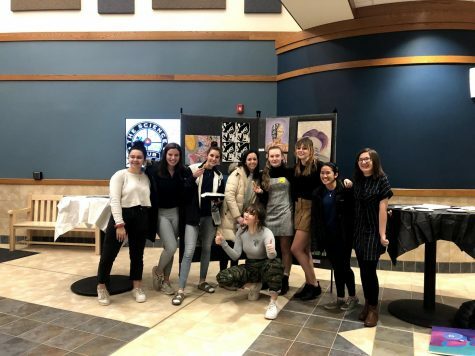 To learn a little more about what’s been going on behind the scenes and what’ll be happening in the scenes of this upcoming show, I talked to two of my good friends Lily McMahon and Margaret Russell. Lily will be playing the role of Little Red Riding Hood and Margaret will be the Baker’s Wife. Here’s what they had to say. Lily: Margaret, you wanna take this one? Margaret: I was just about to tell you that Lily. L: It’s a fractured fairy tale. M: Yes, a fractured fairy tale. It’s a pretty much, a mosh pit of all the fairy tales combined and how it kind of goes poorly when they all combine and when all these characters are taken out of their own bubbles, what they think is reality and what their wants are needs are don’t carry over into this new shared world. L: We got Cinderella, we got Rapunzel, we got the Baker and his wife, we got Little Red Riding Hood, we got Jack in the Beanstalk, and more! What’s been the biggest influence on this show, conceptually? L: Definitely past productions of this. L: Like on YouTube, on YouTube I’ve watched like a professionally shot version of the show like maybe 20 times. M: I’ve done the same probably. Watching a lot of clips of this show and clips from the movie version. Anything besides Into the Woods that you pulled from for your characters? L: I have a playlist on Spotify, with songs that remind me of the spirit of the character. M: Ms. Pillsbury gave us a worksheet for our characters, just to get into the character more. L: Like what is their pet peeve, that sort of thing. M: And like we get to make up our own names for the characters. My character, The Baker’s Wife, doesn’t have a name. So I made one up. L: And that name was Margaret Russell. M: It was actually Meg Russell. M: In all seriousness, my character’s name is actually Brian Foisy. L: I have a journal, that’s like my character journal. It has quotes in it, that I think get me into character. L: Yeah, like in Sharkboy and Lavagirl. M: One time, before rehearsal. [KHS Band Teacher] Mr. Desmaris was wearing a bright blue wig and [Director] Ms. Pillsbury was wearing a hot pink wig. I thought that they looked like Sharkboy and Lavagirl. I told them, but they had no idea what I was talking about. They didn’t find it funny. L: They’re older than us they don’t get it. M: I think they found it offensive. L: I think it may have been a little too niche for them. What has been the biggest challenge in creating this show? L: A lot of people have had to leave this show and a lot have gotten sick during tech week. Tech week is when we have final rehearsals that are full runs of the show. It’s when all the lighting, costumes, sound, and all other components come together for this first time. For that reason, it’s a very important week. M: I think a lot of people have had to come to terms with the commitment of being in such a big show. It’s taken up a lot of our time. But you have to have in the back of your head a notion of: if I give this my full attention and I commit to it, the end product will be that much better. My last question is, if people who don’t do theater could know one thing about people who do theater, what would you want them to know? M: They’re weird. Everyone who does theater is so weird. I was hoping you’d say they’re completely normal, because you’re not breaking any stereotypes. M: You want me to say they’re just like you and me? We’re not. That’s what make us special is because we are a little weird. We’re normal people but we sing and some of us have pink hair. To see Lily and Margaret, and to support our school’s theater program, go see Into The Woods.For more info on dates and times and to purchase tickets go to: https://kpac.booktix.com. Tickets can be purchased at the door but advance tickets are recommended. 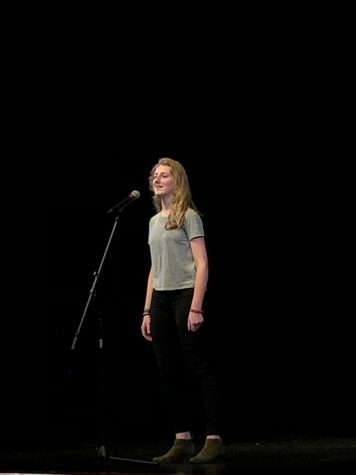 Allison Rickert wins Poetry Out Loud 2018!